The past couple of years have seen a shift in my understanding of the quality of care that is provided for individuals with intellectual disabilities. What I had been told and what I had believed were not the reality of the situation and it has been a soul-searching experience to confront the issues and to take action. We started experiencing problems in the year 2011 regarding issues of medical and nursing care that was substandard and downright neglectful. I started working my way up the “chain of command” within the intermediate care facility which was just an exercise in frustration that I would learn would only get worse as the years progressed. I didn’t want to make trouble and I didn’t want to have a big investigation done. I just wanted the appropriate medical/nursing care to be provided for my son and others. After I exhausted all avenues I knew for healthcare I then approached the Human Rights Committee and outline the Resident’s rights and how they had been violated. Again,my concerns were discarded. I approached the advocacy group for the facility and my concerns were not a priority. Their priority was to keep the facility open and any issues that caused concern for care were ignored for fear it would give the “opposition” more fuel for closure. While I am very concerned about the loss of access to campus based communities and intermediate care facilities, I do not want to compromise on appropriate healthcare that at least meets the minimum standard of care. The care my son was receiving fell far below the minimum and I’m assuming that the healthcare of others was also compromised. Jumping forward 5 years, the problems became more profound and pervasive. It was at this point that the facility actually “self-reported” to the State Investigative Unit since I had claimed there was neglect on the part of the healthcare team and had become so frustrating trying to work with the “team” – as guardian I was excluded from most meetings and not considered part of the team or someone who needed to be consulted or listened to. Neglect was the key word which was taken seriously. Unfortunately, the actions taken were again just another exercise in frustration. It was at this point that I actually started to ask questions about what state agency actually licensees and oversees the healthcare clinic. I learned it wasn’t actually a “clinic” but only space that each professional was allowed to use for paperwork. There was no medical director and there was no healthcare oversight. This revelation was a huge problem with access to appropriate healthcare for the residents. In my audit of my son’s charts I have discovered so many medical and nursing errors in addition to errors in policies and protocols that it is shocking. For instance in the case of 90-day medication reviews there were over 8 medications that were charted as given once or twice a day by the nurse for a period of 1-3 years. They were not given – this was false documentation. These medications were indicated at one time but at a 90 day medication review they should have been looked at and the questions asked if they were still indicated and if not, they should have been discontinued. Instead the nurses just kept signing off they were given – some had never even actually been given at all. As a nurse I find this totally unimaginable. This is not only a problem with nursing documentation but also with pharmacy reviews and the “team” 90 day medical review. These reviews had been signed off as being done and in some cases a medical doctor wrote “med review – no changes” when there had been significant changes in just the couple of weeks prior to the review. If I had been notified of these reviews or a 90 day medication reconciliation form sent to me, I could have very easily have seen what problems were there. Being left out of the team and not allowed to perform my legal duty as guardian caused many problems. At this time, until these issues are objectively reviewed by an independent investigator and the problems actually addressed and not swept under the carpet, I cannot support these types of intermediate care facilities. The Federal Regulations need to be followed and the appropriate care provided. I know in the case of my son this was not happening – I hope it’s not the case for everyone. We often hear about the oversight of care that is provided in the state-run Intermediate Care Facilities. While this may be true for some aspects of care it is not true in regards to the medical/nursing care that my son has received. I am writing this so that others may learn and be aware and know to ask about the oversight at their own facilities. The situation I will refer to is only in regards to my son and the residential habilitation center in which he lives. I am recounting my story so that others may be aware and begin to ask questions to ensure that the medical/nursing care has some oversight by those who are knowledgeable in the community standards of practice for medical and nursing care. Over the past several years my son has had a variety of health problems. I tried to communicate with the healthcare providers at his center but my observations were ignored and I was ridiculed by some of the providers. Other providers refused to listen to my concerns – instead stating “staff has not reported that.” In several cases I ended up taking my son to the local ER to get a diagnosis and treatment since I was not making headway with the healthcare professionals who were supposed to be his primary care providers. At the ER my suspicions were validated and found to be correct but by that time my son had suffered more than he should have. He has also developed some life-long complications from some things that were not diagnosed and treated appropriately by these so-called primary care providers even though I had given them the information and had requested the specific tests to be done. My requests were denied. As a Registered Nurse myself, I really had difficulty with this. Trying to collaborate but not be overbearing or controlling and not putting my son at more risk was a tricky situation. One nurse manager also told me “you need to separate being a nurse and a mom.” Also, I could not understand why the community standards of practice were not followed. Assuming that the “Primary Care Clinic” on site and the infirmary were licensed and had oversight by the Department of Health was the first mistake. I was not only dumbfounded but angry. The investigator had even included a copy of the Nursing Protocol for one issue and the nurse had clearly not followed it yet that fact was not even addressed – it didn’t seem to matter. A couple of months later my son developed sudden significant pain and swelling in one of his feet. This would now be the 4th foot injury in 10 months that he has had. Given the localized swelling and tenderness I suspected a break and requested an xray. Assessment by RN 2 – No swelling, not warm to touch, no pain upon palpitation, no distress walking, no signs of fracture, nothing at all. She notified MD and he agreed with her assessment that no action would be taken unless nursing sees something to indicate client had a fracture. MD did not assess client himself but took this assessment of the RN as fact even though he was aware that I had requested and was still requesting an xray. I requested at least for an Ace wrap or his splint to be applied. I was refused this by nursing because the assessment was that he did not need it. Assessment by RN 3 – stated that swelling appeared decreased and client said “no” when RN asked him if he wanted the splint on – taken as refusal and RN did not attempt to apply splint. Result – Fracture of 5th metatarsal and placed in cast-boot. Again an investigation was done by the State Investigative Unit under Department of Social and Health Services. Photos and a video were sent to all involved and also reviewed by the investigator. It was clear to me that this situation had not been handled appropriately but again, I was dumbfounded to receive the results of “allegations unfounded.” There was one citation though regarding the failure of RN 1 to write a note on a form regarding her first phone call to the MD. The plan of correction by the nurse manager was that this form was obsolete and not used any more so was removed from the nursing protocol. There was not one word about the lack of quality of care – it does not seem to matter. I had a meeting with the administrators and two of the MDs ( not the one that was involved in this particular situation) and asked about professional peer review for the issues that I have raised over the years. That idea had never crossed their minds and they were all unfamiliar with the concept. I am now trying to get the word out there, writing to our legislators, the Department of Health, Residential Care Services in the Department of Social and Health Services to remedy this complete gap in care for our most vulnerable. These residents do not have the oversight and wrap around health and social care that we have been led to believe. But mostly angry at the facility and the agency for failing to provide the quality and standard of care that they have been entrusted to provide. I have no answers now. The Department of Health is not able to investigate since they do not license the facility. I was told to write complaints for each individual practitioner. This has been done and is in process. I filed a complaint with the Residential Care Services to look at the Federal Regulations regarding quality of care, utilization review and standards of practice. They seemed to be a little confused on what I was referring to. I will keep pressing this issue – my son will be taken care of. He now has a full team of healthcare providers in the community but my concern is for those who do not have advocates and have to rely on the healthcare that is sub-standard. If this was your child’s foot what would you do? Please view the video which highlights the need for choices and options in our efforts to provide services and appropriate care and homes for those who live with intellectual and developmental disabilities. This is one example of many that need to be options allowed and promoted. The Arc Washington State recently sent out an alert “Crisis Stabilization Needed in Local Communities.” While this is indeed needed, the information provided by The Arc Washington is not only incorrect with facts but much is actually fiction. As a respected advocacy agency which many legislators and community members look to for guidance publishing alerts such as this actually hurt the people The Arc is supposed to be supporting. Where is the integrity and transparency in their reports? 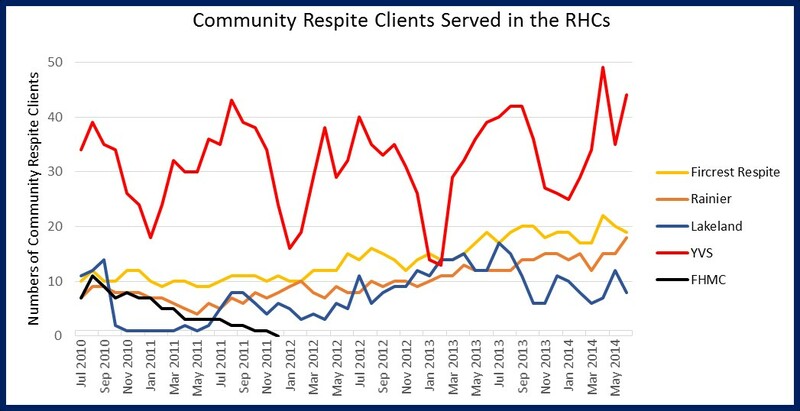 The Arc states that “On average, only 1-3 beds a month are currently used for any respite.” The Data obtained from the Department of Social and Health Services Executive Management Information System (EMIS) dates June 2010 through June 2014 clearly show that the Arc is very incorrect. Below is a graph of the data obtained from the EMIS. 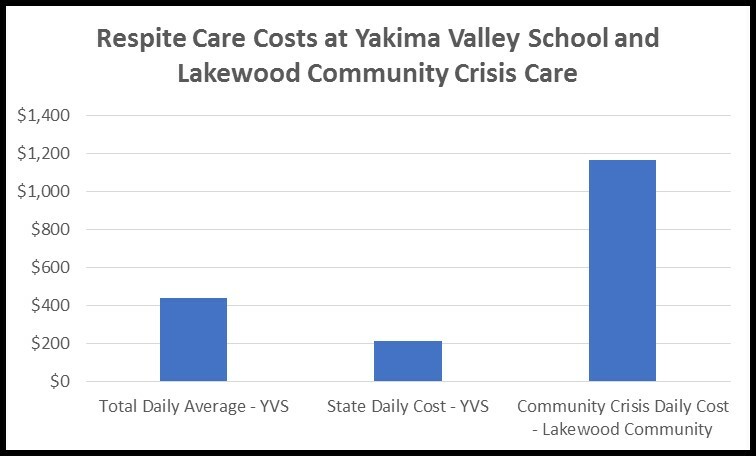 The average has actually been 32 respite clients per month at Yakima Valley School. When provided with the actual data, one can see that we need to pass E2SSB 5243 rather than reject it. This bill does not address anything having to do with respite that people receive in their homes and communities and will not take anything away from them. It will only provide much needed services and help prevent crisis and family breakdown. Yes, we all want respite in our communities but it is not happening for various reasons. Respite can be used for a variety of community outings and opportunities but out-of-home respite is also needed. I can tell you that if my son had been allowed to have any out-of-home respite at all while living at home on a waiver, it may have saved our family and may have prevented him from being moved into the RHC. I believe that out-of-home respite is an essential component of the whole respite program and will add to the sustainability of community programs. Data received from the Department of Social and Health Services, Executive Management Information System June 2010 – June 2014, with correspondence from Mark Eliason, DSHS Office Chief of Policy and Programs; Janet Adams, DSHS Quality Programs and Stakeholders Office Chief; Carol Kirk, DSHS RHC Program Manager; Monica Reeves, Monica Reeves, Crisis Services Program Manager.